By Daniel Horowitz--It’s hard to believe, but, as it’s done for over 40 years, United Jewish Appeal’s annual Walk with Israel is about to turn the streets of Toronto into a veritable sea of blue and white on Sunday, May 26th. By raising money for the Walk with Israel, you are not only proudly declaring to the world-at-large your support for, and love of, the people of Israel,you are helping those men, women and children. • Increasing social mobility and economic independence for poverty-stricken Ethiopian Israelis in Bat Yam through professional and vocational training in various lines of work, including nursing, early childhood education, bookkeeping and more. • Higher education and programs for young people in Israel’s southern region of Eilat/Eilot, including career development and teaching future generations about renewable energy and sustainable development. • Urgent social welfare and educational projects for residents of the beleaguered city of Sderot, which has endured unprecedented rocket attacks over the past decade. And, if that wasn’t enough, by registering and setting up your Walk support page at walkwithisrael.com, and raising a minimum of $1,000, you will be rewarded with one of the following great prizes: - Family pass to Canada’s Wonderland - $200 Best Buy gift card - $200 Apple Store gift card - Family pass to the Ontario Science Centre - Family pass to the Toronto Zoo The Walk kick-off party, held at Coronation Park – across from the CNE’s Princes’ Gates and sponsored by Fabricland – will begin at 9am, with the Walk starting at 10am, rain or shine. This year’s Walk will be chaired by husband and wife teams Micki and Sam Mizrahi and Lauren and Jamie Wise. “Getting involved with community work that is family-oriented is such a beautiful thing to do,” said Micki. “This is a mitzvah project for our family and I love that our kids are involved in this,” added the mother of two. The title sponsor for this year’s Walk with Israel is RIOCAN, Canada’s renowned real estate investment trust. The Walk with Israel ends with the Irwin and Renee Nadal Festival which starts at 12:30pm at The Direct Energy Centre, Exhibition Place, and features rides and games for young children and teenagers; a petting zoo; an Israeli arts and crafts centre; a kosher barbecue; and much more. 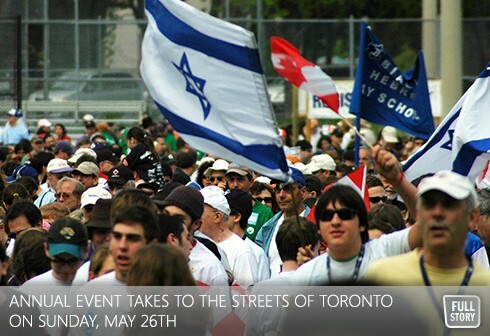 For more information or to register and raise funds online, please visit walkwithisrael.com or call 416.631.5700. *Funds raised for Israel and overseas needs are allocated to Jewish Federations of Canada-UIA, for which authorized organizations deliver services.